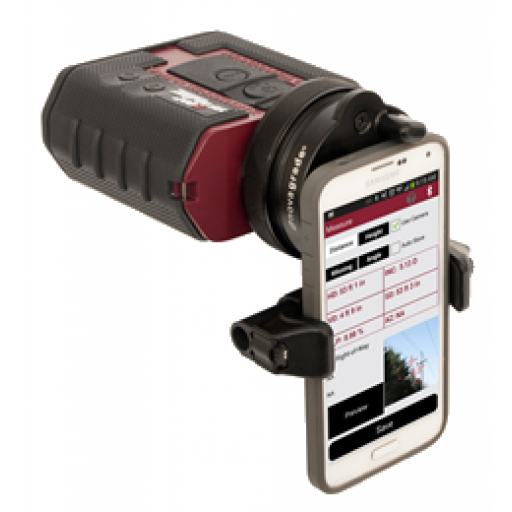 Take laser measurement to the next level of efficiency - integrate any TruPulse laser rangefinder with any smart phone or mini-tablet and have the most comprehensive system of protection and connectivity ever produced for a smart device. From standard distance measurements and height values to verifying span and clearance values, everything can be easily documented on your smart phone, including iPhone or Android, with pictures, videos and all data values from the TruPulse. By using the smart device’s default camera and the Universal Phone Adaptor, anyone can turn their smart phone or mini-tablet into a useful data collection tool. Imagine how much time it will save being able to view real time images and communicate with your home office while out in the field. With the Universal Phone and TruPulse Adaptor, attach photos to your field work documentation or take measurements and instant message and/or email them. Evaluate, troubleshoot right there on the spot, no need to wait until you get back to the office to discuss, and no need to travel back to the site. For use with LTI's LaserSoft Measure app, this adapter aligns with any smart phone or mini-tablet camera to TruPulse Series eye pieces. Secure compression ring mounting system for TruPulse Series units is pre-installed by the manufacturer. For those who need an adapter for a regular sized tablet, we also offer a Universal Tablet Adapter that integrates with LTI's TruPulse lasers.